So do you want to update galaxy A7 to Android Nougat 7.0 ? If yes then you are at right place . 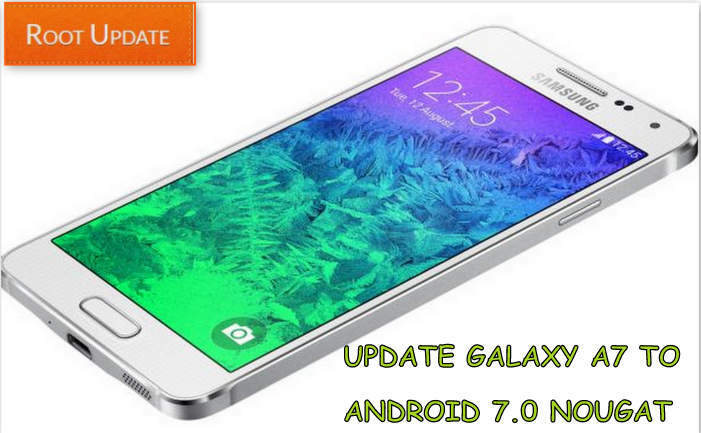 Today we are here with the guide on How to Update Galaxy A7 to Android Nougat 7.0 Manually . Samsung galaxy a7 is a midrange device from company which comes with Android 6.0 Marshmallow out of the box, So in this guide we will Show you How to install Android 7.0 Nougat in Samsung Galaxy A7. Android 7.0 Nougat is one of the best Android version from google so far, the Os is basically a predecessr of New Android 8.0 oreo. The Android Nougat 7.0 Update for Galaxy A7 comes with many new features and Upgrades and not only this but it is also more stable compared to the Old android 6.0 Marshmallow OS for Galaxy A7. So without wasting Any time lets start the Guide On How to Update Galaxy A7 to Android Nougat 7.0 Officially. So in this guide we will show you the Official way to update galaxy A7 to android Nougat 7.0 but before that have a look at the the pre-requirements and advantages and Disadvantages after you Update your Device to Android 7.0. Make sure there is more then 4Gb space in the internal memory. Extract the firmware files one the Desktop Of Your PC. Now Open The ODIN tool to Flash firmware on Your Galaxy A7..
Verify that Auto Reboot and F.Reset Time are checked or enabled, and other options are left at their default values. Note: Make sure re-partition option is not ticked and do not load the PIT file found inside the firmware zip file as it will re-partition the device unnecessarily. Thats ALL !!! Now Just tap on reboot. So this was our guide on How to Update Samsung Galaxy A7 to Android nougat 7.0, I hope you liked our guide and if you have any doubt you can comment down below in the comments Section.